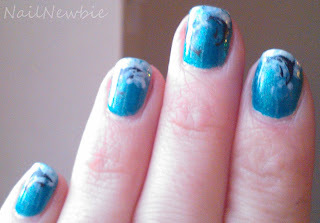 Nail Newbie: Under the Sea! This week's Adventures in Stamping challenge was to create an Under the Sea themed mani. I don't have any stamping plates with fish on them (apart from the weird little dead fish on one of the BM plates) so I was at a loss at what to do. I do have a couple of sea-weedy stamps, but that would have meant free handing some fish or something, and I knew that wouldn't turn out well! 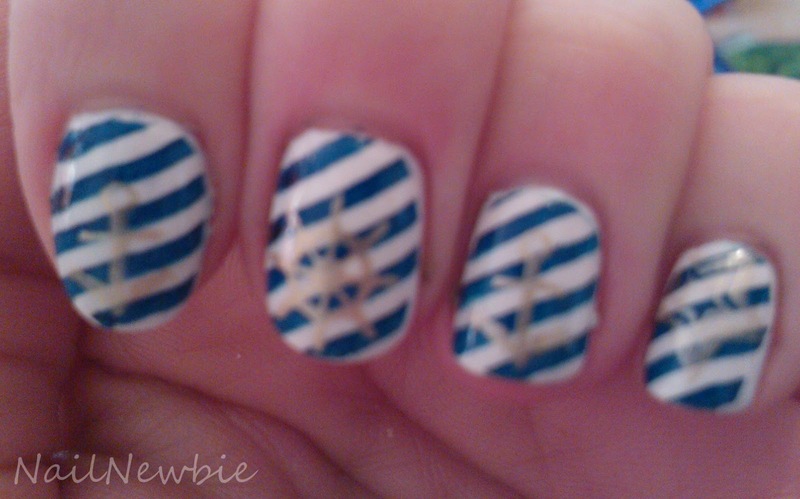 On Friday I did another nautical themed-manicure using a stripy stamp and some stars anchors and a ships wheel, but thought that was cheating a little. So Sunday night (last minute, moi?) I settled on this. I used Wet n Wild Teal of Fortune as the base, sponged a white creme mixed with a little Collection 2000 Sparkle Top Coat for the waves on the tips and then stamped the dolphins from my Born Pretty Hello Kitty (M71) plate with Wet n Wild Black Creme. Dolphins playing in the surf! 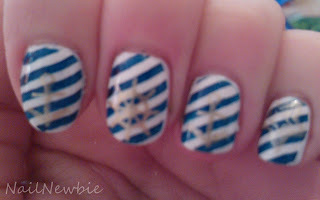 This was the nautical mani I'd come up with before - Wet n Wild French White base, striped stamped with 2ture Colour Quick Fast Dry Shade 10 and anchors/wheel/stars stamped with Barry M Gold Foil. I love the manis! They look so fun!